Manila (Philippines) – December 21, 2017 (travelindex.com) – Movenpick Hotels & Resorts has signed a new property in Manila, expanding its portfolio in the Philippines to three properties strong, and marking another milestone in the company’s Asian expansion strategy. “The Philippines, which is emerging as one of the world’s fastest-growing economies, is a target development market as we continue our expansion drive across Asia,” said Andrew Langdon, Global Chief Development Officer, Mövenpick Hotels & Resorts. 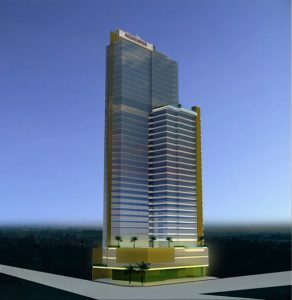 Mövenpick Hotel & Residences Quezon City will feature two upscale restaurants serving Chinese and international cuisine respectively, plus a chic rooftop restaurant and bar boasting panoramic views, which is tipped to become one of Quezon City’s most popular nightspots. The hotel is just 17km from Manila’s Ninoy Aquino International Airport, the Philippines’ main international gateway, offering direct connections to and from major cities including London, New York, Los Angeles and Sydney. Mövenpick Hotels & Resorts currently operates two upscale hotels in the Philippines: Mövenpick Hotel Mactan Island Cebu and the recently opened Mövenpick Resort & Spa Boracay. Mövenpick Hotels & Resorts, an international upscale hotel management company with over 16,000 staff members, is represented in 24 countries with 83 hotels, resorts and Nile cruisers currently in operation. Around 40 properties are planned or under construction, including those in Kuredhivaru (Maldives), The Hague (The Netherlands) and Basel (Switzerland). Focusing on expanding within its core markets of Europe, Africa, the Middle East and Asia, Mövenpick Hotels & Resorts specialises in business and conference hotels, as well as holiday resorts, all reflecting a sense of place and respect for their local communities. Of Swiss heritage and with headquarters in central Switzerland (Baar), Mövenpick Hotels & Resorts is passionate about delivering premium service and culinary enjoyment – all with a personal touch. Committed to supporting sustainable environments.